UPDATED: Sun., Sept. 17, 2017, 6:15 p.m.
Save for a pair of long, Herculean carries by 49ers running back Carlos Hyde, Seattle bested its NFC West rival by nearly every metric Sunday. The scoreboard almost told a different tale, though, another glaring indictment of a Seahawks offense that couldn’t reach the end zone until their season’s 20th possession. Even in the rare instances when Russell Wilson had ample protection, drops, penalties and faulty red zone play handcuffed Seattle, which found itself in a white-knuckle affair at home with one of the NFL’s more downtrodden organizations. When Wilson connected with Paul Richardson midway through the fourth quarter for the go-ahead touchdown, it was a somewhat redeeming occurrence against a 49ers team with 35 new players, 15 rookies and its fourth head coach in four years. Wilson, who was sacked three times for the second straight week, was a pedestrian 23-for-39 passing for 198 yards. His receivers couldn’t get deep separation, and when they did Wilson couldn’t get a good look downfield as he was trying to elude the 49ers’ young and capable defensive line. The foot of Blair Walsh has now accounted for 15 of Seattle’s 21 points this season, and yet Seattle is a couple plays away from being 2-0. The tell-all statistic of a defensive-laden team. Seattle’s defense flummoxed the 49ers, who generated just 248 yards of offense, more than half coming from Hyde (15 carries, 128 yards). Quarterback Bryan Hoyer was hard-pressed to find an open window, throwing for a paltry 99 yards and an interception. He was also sacked twice. This defense is giving Wilson and Co. every opportunity to march down the field. Reaching the end zone just 20 percent of the time would likely be enough, but right now even that seems like a pipe dream. Remember when an undrafted free agent rookie out Central Michigan, Thomas Rawls, impressed in 2015? Chris Carson, a seventh-round draft pick out of Oklahoma State, could supplant Rawls by doing the same thing. Rawls returned from a high ankle sprain on Sunday, but it was Carson who has proven to the most effective back through two games. He accounted for 93 yards on 20 carries, a week after totaling 39 on six carries. With a stable of backs including Eddie Lacy, CJ Prosise and Rawls, Carson is making his case to be this team’s premier back. It took only a couple years for Seattle and San Francisco to develop one of the more heated rivalries in the NFL, one that reached its zenith in 2013 when both teams reached the NFC title game. 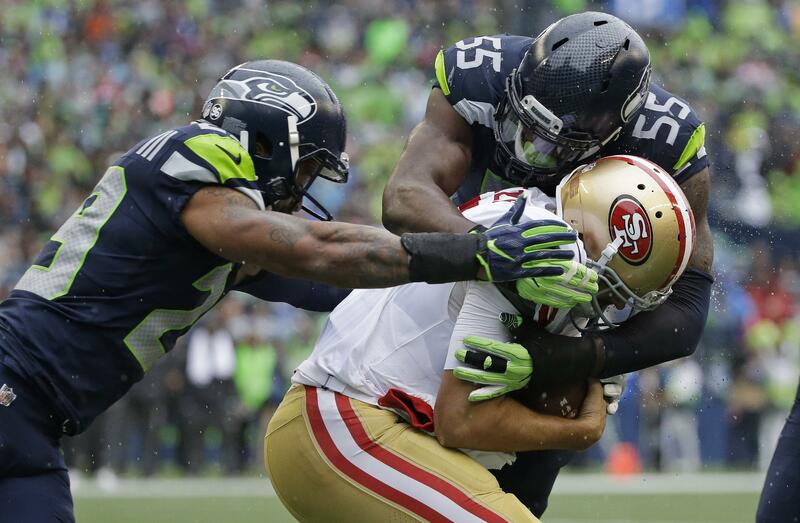 Seattle beat San Francisco for the eighth straight time on Sunday, though, and tenth time in 11 tries. Richard Sherman’s oh-so-memorable beef with Michael Crabtree seems like a decade ago. A Niners win Sunday would have pumped some life into this thing. Published: Sept. 17, 2017, 5:24 p.m. Updated: Sept. 17, 2017, 6:15 p.m.